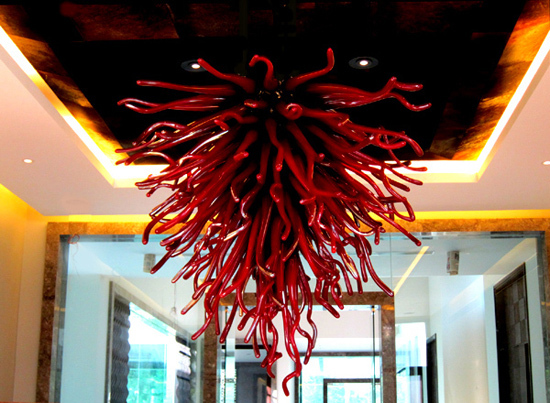 Red Hot Chillies – a Blown Glass Chandelier created by the artist for a private residence in Delhi is a compilation of individually blown ‘Chilli like’ glass which come together to form a brilliant explosion of Red Glass under projected light. More than 110 ‘Chilli’ were hand blow, each into a unique shape and assembled together to form this mesmerizing installation. The chandelier is 6 feet in width & 6 feet in height suspended from a 14 feet high ceiling.